with permanent magnet rotor and 2, 3 or 4 stator windings. A capacitor is connected to one of the coils for rotation in appropriate direction. The only exception is series UDS1. 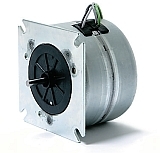 This unidirectional synchronous motor has a special construction with only one coil and internal backstop inside for a defined direction (clockwise or counter clockwise). Special features: synchronous motors have constant speed, independent of the load (depends on frequency only) and detent torque when power off. Motor can be blocked without overheating. We combine synchronous motors to many gearboxes. Mounting supplies are typically available on stock.